Sports and fitness educators have been identified as key influencers for consumers when it comes to nutrition education and messaging. As well, given this is a Winter Olympic year, amateur sports will be a topic of focus in the media so sports nutrition will also be a topic of interest. As such, investment was made in Q1 to secure rights to a community targeted basic sports nutrition education resource developed at the University of Alberta, Why Act Now program. The investment includes rights to use and modify the information as well as reference the Why Act Now program. Also secured is the opportunity for 2 speaking engagements featuring the lead U of A researcher for Think Beef marketing efforts. In an effort to make an education resource that would be marketable as a public health resource for amateur coaches and parents of sports engaged youth, the U of A Why Act Now sports nutrition Power Point deck was reviewed and revised with input from a team of dietitians: RD sports nutritionist, physical fitness consultant and RD influencer/media lead. As a result, 2 resources, Fuel Up For Fun, were developed and posted at ThinkBeef.ca: Power Point Presentation tool and Digital downloadable e-book. The Fuel Up For Fun resource was soft-launched with sports educators at the Ontario Physical and Health Educators conference. Results to date: The promotion plan for the resource is underway with 3 media outreach opportunities in Q3 and Q4 planned to date as well as 2 to 3 conference opportunities. Two provincial organizations have expressed interest in collaborating with a regional media outreach efforts that will be integrated with the Partner with a Player Hockey Canada promotion program (see below). If budgets allow, investment will be made to the resource will be assessed by target audience to determine if improvements need to be made. luding QC) was bonused an additional 2 weeks at no cost. Poster and video placements and consumer insight research (pre & post) were elements included in the campaign. Two 30 second videos played twice per hour for 6 weeks at 225 locations (777 TV screens). Two versions of posters were installed at 40 locations. Approximately 200 respondents participated in each of the pre and post consumer surveys. Results to date: Neilson Data report confirmed video impressions totalled 4.56 million. Poster impressions totalled 995,200 impressions. Third Party Campaign Impact Study reported gains in unaided ad recall from 46% of respondents in last fiscal’s Q4 program, to 71% reported this fiscal. (Note: the normal ad recall for campaigns is 30%). Consumer survey results indicate club members have an affinity for beef with 81% of consumer serving beef at home twice per week and 94% of them being familiar with the fact that beef is a good source of protein. 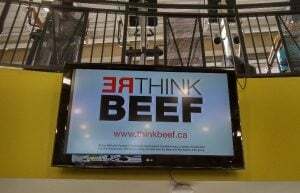 ThinkBeef.ca is dedicated to spreading the word about the taste, nutrition and goodness of beef. ThinkBeef.ca is funded by import levy fees. Import levy funds are collected on all beef and beef products imported into Canada by the Canadian Beef Check-Off Agency. Programs are administered by Canada Beef.